Reflections on God's Word and Will by Kenn Anderson, Jr. I like movies. My favorite movies are the ones that make me think. I believe that ANY movie should make you think, because we should always evaluate what we see and hear, but some movies are truly thought provoking. The best of the thought-provoking movies cause me to evaluate who I am and who God would have me to be. In this regard, my favorite movie is one that most people have probably never heard of, a science fiction movie called Gattaca. 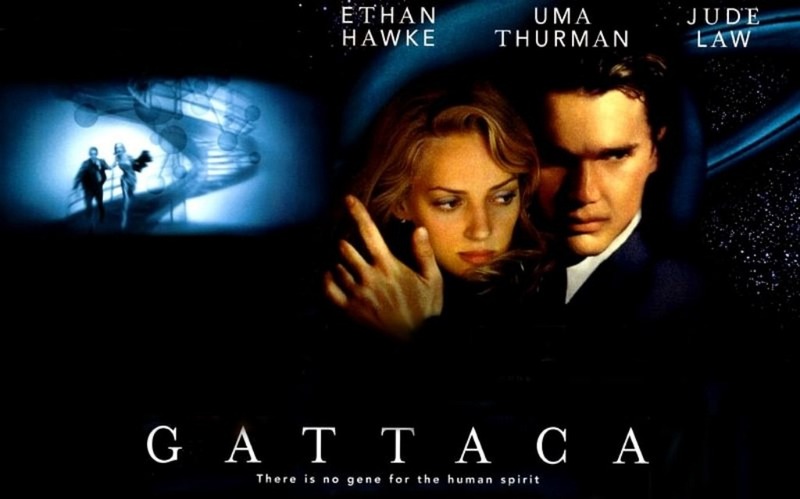 While Gattaca is not a Christian movie, there are many Christian themes throughout the movie and there are many ideas and concepts that should provoke thought in any Christian that watches it. The movie is a cautionary tale which takes place in a near future where DNA analysis and genetic manipulation are commonplace. Virtually everyone is conceived in laboratories in such a way that only the best genetic material is selected from each parent. Anyone conceived naturally is at a distinct genetic disadvantage and society has effectively split into two classes of people through discrimination that, while technically illegal, is almost impossible to stop or control since simple DNA test of a stray hair or piece of skin easily reveals the true genetic nature of any individual. Those naturally conceived, known as in-valids, are considered societal outcasts and relegated to only the most menial and undesirable vocations. The protagonist of the story, Vincent, is one of these outcasts and his parents are informed almost immediately upon his birth that he is fragile and has a 99% chance dying of a heart disorder at the age of 30. The movie is about his struggle to achieve his absurd goal of becoming an astronaut and making it to space, something that is reserved for only the absolute best and brightest, the perfect – something he could never hope to achieve due to his “inferior” DNA. In order to get into Gattaca, the space travel and training institution, he has to borrow the DNA – blood, hair, skin flakes, etc. – of someone who IS genetically perfect and pass himself off as that person. Any small amount of his own DNA would make him unacceptable to the institution. While there are many ideas and concepts that I find thought provoking within Gattaca (I quite often glean some new nugget of truth from it each time I watch it), the idea of this borrowed perfection struck me as particularly relevant to the Christian experience. Entrance to heaven and experiencing a personal relationship with God is reserved for those who are perfect and sinless. Any small amount of sin, regardless of how tiny it is, renders us completely unacceptable. No matter how hard we try, no matter how much good we accomplish in this world, no matter how many times we go to church, no matter how often we pray – we can never hope to be perfect. We cannot hope to be sinless, which means that we are doomed to be eternal outcasts. We need to borrow someone else’s perfection. While Vincent had to go through an unbelievable amount of effort and deception in order to pass himself off as perfect, the work has been accomplished for us by Christ and we are not to hide it, but are to share it and declare it boldly because His perfection is boundless. 21But now the righteousness of God has been manifested apart from the law, although the Law and the Prophets bear witness to it—22the righteousness of God through faith in Jesus Christ for all who believe. For there is no distinction: 23for all have sinned and fall short of the glory of God, 24and are justified by his grace as a gift, through the redemption that is in Christ Jesus, 25whom God put forward as a propitiation by his blood, to be received by faith. This was to show God’s righteousness, because in his divine forbearance he had passed over former sins. 26It was to show his righteousness at the present time, so that he might be just and the justifier of the one who has faith in Jesus. Kenn Anderson, Jr. with his lovely wife, Marcia, during a visit to the Grand Canyon. Kenn Anderson, Jr. grew up in northeastern Pennsylvania, graduated from Lackawanna Trail High School and Keystone Junior College, served in the United States Navy, and is a man of many diverse interests. Professionally, he is involved in many aspects of information technology including web design, managed services, system administration, and project management as the Director of Managed Services for Ethixa Solutions. Personally, he is devoted to his wife, Marcia, and three children – Marilyn, Samuel, and Melanie and they live in Marcia’s childhood home in Scranton, PA. Spiritually, Kenn trusts in Christ alone for salvation and is involved with Hope Church in Moosic, PA as an elder. Recreationally, Kenn enjoys reading, movies, gadgets,golf, and many other things in this world of God's.